Just a quick note to let you know I have updated the current programme to the end of December click her to go to our Meetings tab. Well maybe not all the president’s men but definitely ‘all the Chairman’s Ladies’. 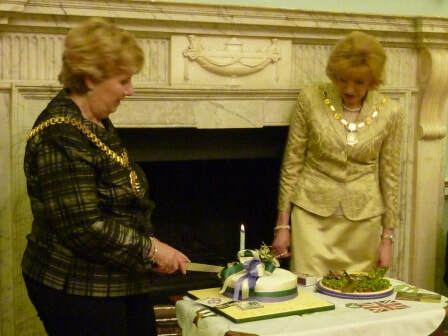 As president I was invited by Jayne Jefferson to join all the Presidents from the Nottinghamshire WI’s to a reception at the Town Hall in Newark. We were all there to celebrate 100 years of the WI being in Nottinghamshire. The Mayor of Newark was in attendance and it was a great opportunity to mix with ladies from around the Nottinghamshire area to talk to them about what they are doing in their areas. The food was great, I especially enjoyed the cake. There was a raffle with the funds raised being given to the Mayors choice of charities and coming soon there should be a picture of all the attendees of the evening. If you are going to the Federation Meeting at the Royal Centre Nottingham the picture should be on display. 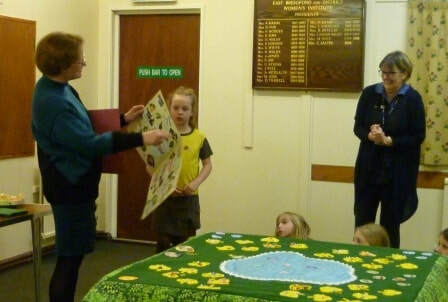 Last year East Bridgford Brownies approached East Bridgford WI to ask for assistance with updating the mat they use as part of their weekly meetings and when the girls make their Brownie promise. 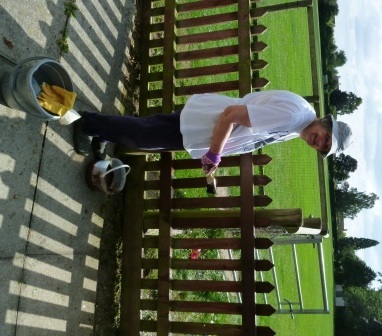 We thought this would fit well into the Chairman’s Community Challenge for the County Centenary Year. 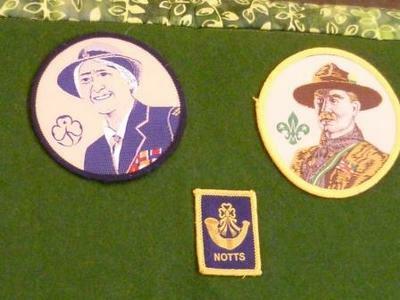 EBWI members went along to the Brownies each week until every Brownie had sewn their own design of beads and sequins onto a trefoil which the EB craft group sewed onto some felt matting which we then embellished with a pond, some embroideries and all the brownie badges. We recently had a handing over ceremony at our hut and received a beautiful hand-made thank you card from the girls. 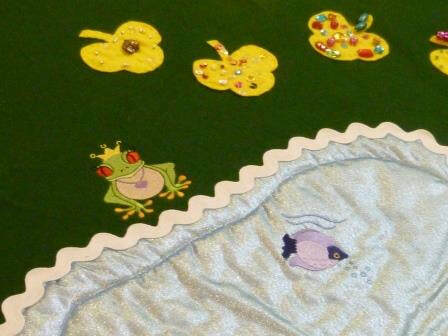 There are more pictures on our Craft Group page. This was the last evening for Christine as President she has served as President for two years and she decided it was time for someone else to take up the baton. In the picture you can see Christine as she takes us through the formal business of the annual meeting. In the background are some exhibits from our set of costumes for playing Living Whist which were made back in the early days of our institute. They are all hand painted and still look amazing after all this time. 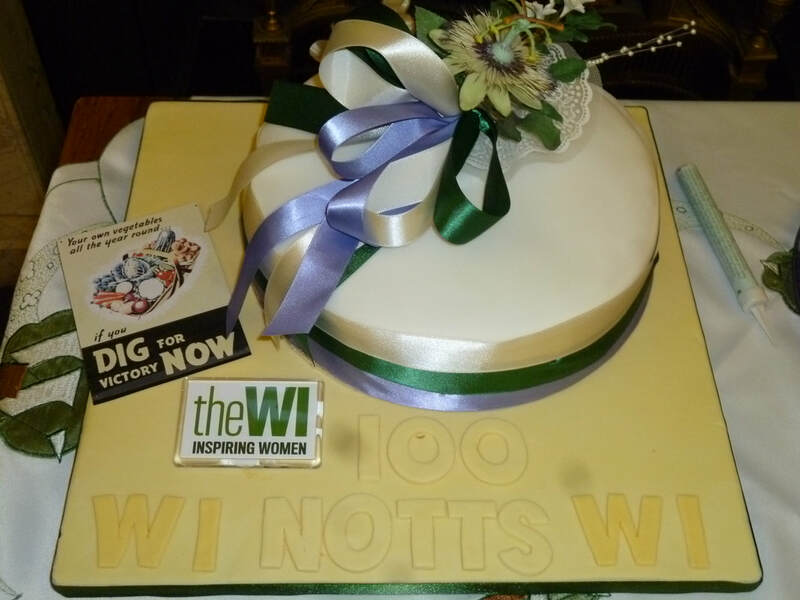 They were on display at County House in Newark 14th to 16th March as part of an exhibition of memorabilia of 100years of Nottinghamshire Federation of WI’s. Our new President for 2018 is Dorothy Downie (that’s me who write this column) and following the formal business of the evening we had a bit of fun with a Clothing Quiz, wine was served and instead of cake we had cheese and biscuits to finish off the evening. The Nottinghamshire Federation centenary luncheon was held on a beautiful summer's day at Ye Olde Bell in Barnby Moor. This luncheon was open to all members of the Nottinghamshire Federation and many WI's were represented. We enjoyed a three course lunch. This was followed by a guest speaker who entertained us with stories of his time as an Auctioneer around the Nottinghamshire area. The chairman had baked a beautiful cake which we all enjoyed with our after lunch coffee and tea. The lunch closed with a rousing rendition of Jerusalem. Many thanks to Marjory for doing the driving, so Densie and I were able to indulge in the odd glass of wine with lunch. Cheers Marjory. As usual more pictures are over in our gallery. 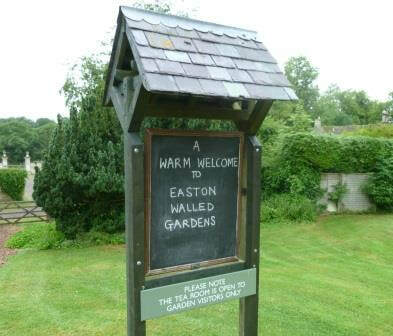 Despite the rain a hardy bunch of ladies turned out at the village car park and we all set off for our Centenary Outing to Easton Walled Garden which is famous for its Sweet Pea Collection. Upon arrival the owner gave us a very interesting talk on how the garden came about and the different types of sweet pea (this is not standard but can be booked for a small charge to groups who are interested). With tea and biscuits included we were well set for our wet walk. We had a couple of hours for meandering around the gardens, there was such a lot to see. Lunch is available in the café on site and it was nice to get warmed up after being out in the damp weather. 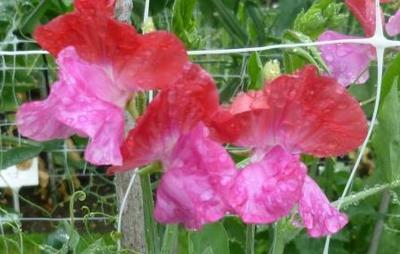 Finally many of us bought sweet pea seeds ready for autumn or next spring planting - if I can just remember where I put them? I took some photographs a few here but more are over in our picture gallery. So I will let you browse. We all had a great day but I am sure if you go when the sun is shining the flowers would be even more glorious. The run of good weather we have been enjoying came to an abrupt halt on the day of our planned garden meeting. We awoke to grey skies and the heavens opened, when it was not raining it was a deluge. Not to be defeated we once again implemented 'Plan B' and took cover in the WI hut. Brenda gave us a humorous report on her trip to the NFWI annual meeting at which the two resolutions, 'Saving our precious Oceans' and 'Reaching out to People living with Loneliness' were passed. No doubt we will be hearing about these in the coming months. This was followed by a Quiz with a garden theme which challenged even the best gardeners in attendance with no one quite managing a 100% score. We had a bit of a buffet with wine to round of the evening. The photograph in this article was taken on our day out to Easton Walled Garden (another damp English summers day). I will do a separate post on our day trip soon. 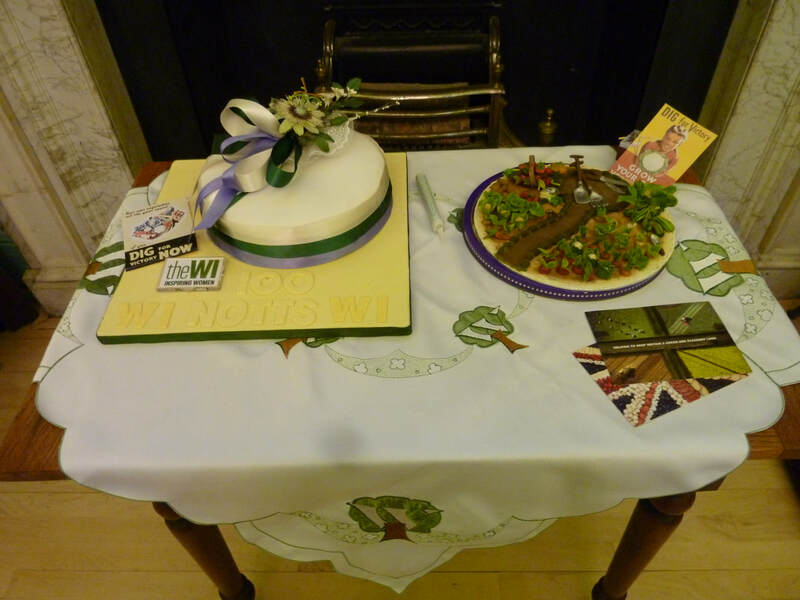 Many Teas, Coffees, sandwiches and cakes were served to visitors to the WI hut on the East Bridgford show day. Four of our members entered the group section of the fancy dress competition and came third with there costumes which are part of a complete pack of cards that can be used to play 'Living Whist'. The village show has a number of competitions for budding cooks and gardeners to enter. To mark our centenary year we purchased a Salver which will be presented each year to the winner of the best preserve in show. This year's winner was Sarah Howard with her jar of tasty marmalade. Our president Christine was on hand to make the presentation. You can find more pictures over in our gallery. For our April meeting the talk was given by Claire Coles from Cancer Research UK the worlds leading charity dedicated to saving lives through research. This is a subject many of us would probably prefer to avoid even though most of us have been touched in some way either personally, or know a family member or friend who has been affected by this disease. it was good to find out more about what the charity is doing to improve survival rates for those affected by this disease. The talk was presented in an interesting, informative and interactive way and we all came away with a better understanding of what Cancer Research UK are doing with the money we contribute by personal giving, shopping at their charity shops or through legacies. The ladies darts team have won the league again this year a big congratulations to all those involved. It is a big night on Thursday as there is a play off tournament for an overall winner so best of luck for this evening. I will let you know how they get on. The Nottinghamshire Annual Federation Meeting took place at the Royal Concert Hall in Nottingham on the 6th April. You can find a full report of the day on the events page of the Nottinghamshire WI website. 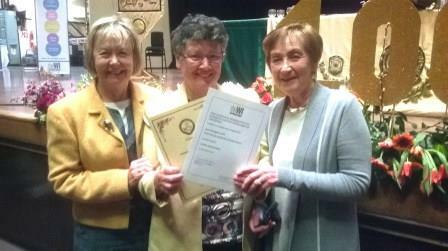 During the afternoon session our president Christine was invited on stage and presented with a 100 year anniversary certificate. We will be celebrating our 100th birthday later this year if you pop over to our monthly meetings page you can find more details of the anniversary events in the pipeline. The ladies who attended the event reported back as having thoroughly enjoyed their day out. Well I finally got around to updating the website with some of our activities for the first quarter of 2017 - it never really takes as long in reality as the thought of doing it!! For anyone who had taken the dates of events from the Monthly Meetings page please note that the date of the Centenary Picnic Outing has been changed and is confirmed as 29th June with a trip to Easton Walled Garden. Fingers crossed for sunshine on the day. Rumour has it we have been doing well in the Darts tournament again this year. I will find out this evening and let you know. At our March meeting fun was had even though it was the Annual Meeting. 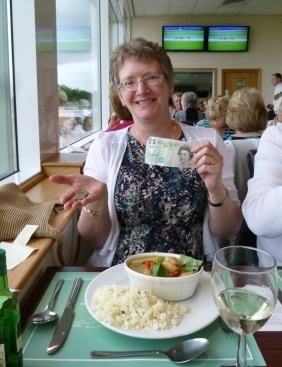 Thanks to Sue who organised a quiz to entertain us, following the following the formal business of the evening. We were intrigued to remember advertisements going back to the 60's. Seeing the images one could remember associated tunes and comic actions. Reports were read from our craft and darts groups as well as a full trustee report of the year. As we begin our Centenary year our W.I. finances are quite robust and we are looking forward to the year ahead. Mrs Christine Salter is to be President once again and she thanked everyone who had contributed in any way to the smooth running of the Institute. Shirley Whitfield's 'Hats for Panto' turned out to be a super entertaining talk about her life's work. Leaving school early and training to be a milliner she created hats for the Postilion riders at the Queen's coronation, all before she was 21. After moving to Nottingham she worked for many years making costumes particularly hats at the playhouse. Shirley brought many of her creations and we admired the historical accuracy of many a thoroughly enjoyable evening. You can see more pictures of our ladies modelling the hats over in our picture gallery. Hi - it has been a while since I updated our website and I will be working on that this week but in the mean time if you pop over to the monthly meetings page I have added the 2017 programme details for your information. I look forward to seeing you all tomorrow evening for our Annual meeting. 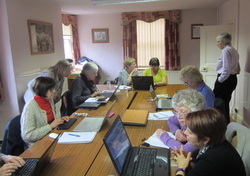 As soon as the formal business is out of the way we can get on with some fun with a quiz, cup of tea and cake. Every year about this time there is an Apple Day festival to celebrate the UK’s favourite cooking apple in its home town of Southwell where the Bramley apple was first propagated more than 200 years ago from the garden of a cottage on Church Street. The festival celebrates all things apple and there are a number of competitions open to Women’s Institute members. One of our members Margaret Foss is very involved in the organisation of the Annual Apple Day event and this year we took the plunge and entered the competition Class 4 Tea for the Speaker with an Apple theme. There were six entries in this contest I managed to get photographs of 5 of the entries but unfortunately missed the winning entry. We were surprised and very pleased to achieve second place. It really was a great team effort with 5 ladies coming together with all their different skills to present a great entry. It was a shame about label on our apple preserve which btw was a jelly. But it was a lesson learned, so watch out ladies as we are now all fired up for next year……..
At our October meeting we had a talk life on a Tall Ship with Lynne Miles who entertained and inspired us with slides of three trips she has taken through the Jubilee Sailing Trust whose mission is to promote the integration of people of all physical abilities through the challenge and adventure of sailing tall ships on the open sea. If you are at all interested in taking to the high seas I would recommend you have a look at their website it certainly sounds like a life changing experience. EBWI have for a number of years had the job of looking after a planted area in our village. Here are a few photos of Liz Reed and Brenda Youngs replanting the triangle on Lammas lane this involved pruning weeding and putting in lots of new plants, supplied by Frosts' our local plant centre who gave us a generous discount. 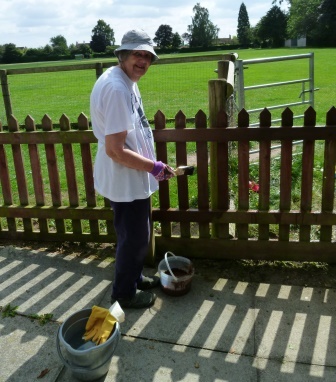 Very exhausting but good end result and a feature that can be enjoyed by all the residents in the village. A number of members attended the Nottinghamshire Federation Group meeting held at the Everyday Champions Centre in Newark the first part of the meeting is taken up with business and the presentation of awards that included a presentation to the winners of the darts tournament and two of our members went up on stage to collect the trophy. The main event was Speaker Lucy Adlington Costume Historian who gave a talk ‘Tea Gowns and Tea Time’. The talk was really interesting and I was very envious of Lucy who gets to model these wonderful outfits. At the end of the evening we were allowed up onto the stage to get a close up of the gowns that had been displayed, which was a rare treat. Ruth who must have managed to get nearly the last raffle ticket on sale (there was a problem with the raffle tickets and they ran out at about 7pm) took home a bottle of plonk which I am sure she enjoyed. We held a coffee morning on Saturday 22nd September to raise funds for our centenary celebrations in 2017. There were cakes galore, tea, coffee, a ‘bring and buy’ stall, cards and wrapping paper to be purchased and a win a bottle of prosecco competition. 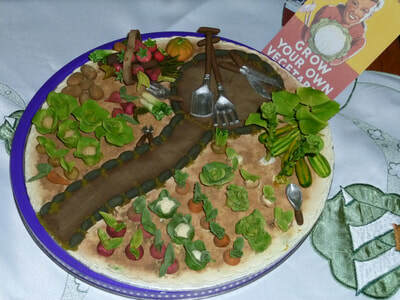 Go to our gallery to see more pictures of the produce available on the day. The morning was a great success and I would like to say a big thank you to everyone who baked for us before the event and to everyone who supported us on the day. Blooming Scumptious came to our meeting this evening to show us how easy it is to decorate cupcakes and make a bouquet from the result. It was a very hand’s on demonstration with a number of the ladies in the audience participating you can see the concentration on their faces in the pictures over in the gallery. Irmgard (one of our members) very kindly invited us to Nottingham croquet club by the university to have a go at croquet – no experience necessary. It was a very hot summer’s day and we were all glad that we had our hats at the ready when we convened at the club for a quick introduction to the game. We were given some expert guidance then were let loose on the greens. For most of us it was our first experience so we were pretty much at the same level but one or two had clearly played before. 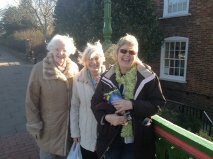 We all had a good time and it was lovely to be out in the sunshine on such a beautiful day. In good WI tradition Irmgard had baked a cake and after playing a number of games we retired to the club house for a most welcome cup of tea and slice of home-made cake. There are more pictures in our gallery for you to enjoy. In august we do not hold an open meeting but we do get together to have a members only dinner. This year the committee cooked for the members each committee member taking on an element of the catering so the task was shared out between us without it being an onerous task for one individual. On the night we did get a couple of willing workers in to do the washing up so everyone could sit down and enjoy the meal without having to worry about doing any chores. As always the committee did us proud and the food was excellent. There are more pictures in our gallery for you to enjoy. 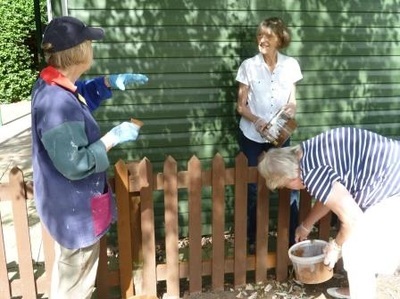 You may have read my earlier post on fence painting back in June (see post from 16th June). 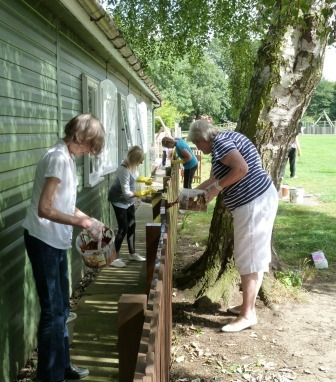 The weather in August was much better than in June and about 10 ladies came along on a lovely sunny day What appeared to be a daunting task at the start of the day was virtually completed it was definitely a case of many hands making light work. 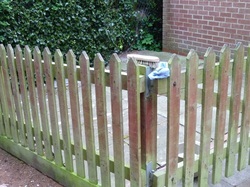 I say virtually finished as we ran out of paint with just two fence panels to paint. 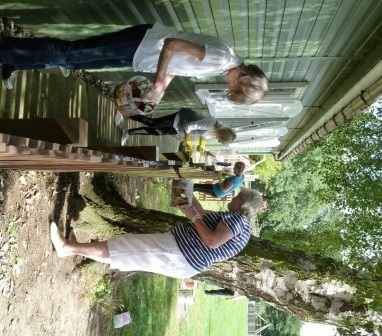 Many thanks to all the ladies who helped and to all the friendly villagers who offered advice and chat during the day. As I waited at the bus stop for the car to pick me up I took a moment to think what was I doing - it was a Monday evening and I was going dog racing with the WI. Not something that springs to mind when you think of the WI but I can tell you that there were many tables full when we got there and lots of ladies from WI’s across Nottinghamshire had come together for a great evening of greyhound racing and a meal. I told my husband I was sure I would not be late (I was wrong about that as well). There were 14 races starting at 6.30pm with the last race run at 10pm. 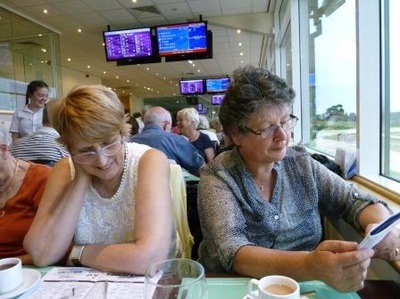 Here you can see Christine with a friend studying form and a rare picture of me (I am the one usually behind the camera) with my first winnings of the evening. The food was excellent and if you get the opportunity to go next year don’t hesitate in signing up as it was a great evening. Traditionally our July meeting is held in a members garden and this year the plan was to enjoy the garden of Valerie James but the weather was not kind to us on the day so we had to revert to plan B and we all met at the WI hut where Sue and Dorothy had organised a quiz just in case. The theme of the quiz was “where was the photographer”. All the photographs were of views in the village but the answer was not 'what is the photograph?' but 'where was the photographer standing when the picture was taken?'. We certainly had everyone guessing on the night and everyone had a good time trying to work out the answers I have posted a few of the picture in the gallery Photos of Events - 2016 and if you have local knowledge I am sure you will be able to work out the answers. We need to say a big thank you to the team as by the end of the day significant progress had been made by workers. As promised in the Village Magazine the results of the Darts tournament are in and we must congratulate the members of our darts team as East Bridgford are the Champions. April meeting - At our April meeting we all thoroughly enjoyed meeting Debbie Spencer who gave us an excellent talk on the Long Clawson Dairy a local producer of traditional Stilton Cheese since 1911. There were plenty of samples to taste - the cubes of mature stilton were so well liked the plate went round the room twice. March meeting - Our March meeting saw the election of a new committee and President. Marjory Soar stepped down as President and Christine Salter has taken over the role - we all wish her well. We also celebrated our 'longest serving member- Sheila Johnson has been a member of East Bridgford W.I for 65 years! /photos-of-events---2016.html . There can't be many members in the County with such a record. Sheila is a very active member playing darts weekly and is always ready and willing to wash or dry our cups and saucers at meetings. She is looking forward to celebrating our Centenary in 2017. On Saturday 5th March we will be meeting at 9.30 in the Village Car Park to join the local Scouts in a 'litter pick'. Followed by coffee and cakes at the Methodist Hall. Litter picks and bags will be provided so if you have an hour or so to spare please come along and support this community event. Pat Clark gave members an informative and entertaining talk about the 2 years she had volunteered in a small town in Bangladesh. Pat and her husband worked alongside teachers, university lecturers and government officials helping to introduce modern and interactive teaching methods. Another volunteer, working in a hospital regularly had to check patients' beds at night as members of the patient's family were likely to sneak on to the ward to join them in bed! Pat was persuaded to employ a "home help" to carry out domestic chores as this gave her more free time and provided employment for a local young woman. The couple integrated into the community learning a few words in Bangla, and the abilty to shop in the local market, befriending one stall holder to ensure they always bought fresh produce. Our December meeting was a lot of fun! Kurling and a faith supper. Some of us had tried kurling before and many had not. It was good fun and everyone could 'have a go'. 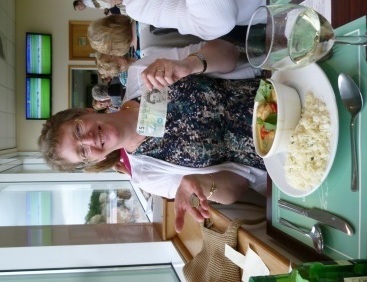 Many thanks to Wendy and Jane who not only organised the bowling but also organised us! The faith supper was plentiful and varied - it's amazing that we had no mince pies or sausage rolls but lots of lovely fare. At our November meeting members were both entertained as well as educated by Neville Cooper and Harry Heppingstall who performed various pieces of South American Dance music. We heard music ranging from a sedate Pavan to lively Sambas and Tangos. We heard the stories behind the music as we journeyed from Cuba, through Mexico and Brazil to Argentina. There was much 'toe tapping' and 'head nodding' throughout a most enjoyable evening. Our September meeting was titled Ladies in Pigs- an incredible title- for 2 excellent speakers who both have connections with the Pig industry. Along with similar ladies throughout the country they got together to promote British Pork and Bacon. They go to agricultural shows, into schools and as with our meeting demonstrate pork dishes and give advice about British meat. They emphasised we should always look for the Red Tractor Mark on meat products to be sure the animal was born, raised, butchered and packed in Britain. The Union Flag on products might mean the meat was only packed in Britain. Our speakers Mary and Lizzie demonstrated a Moroccan pork dish, a Bacon, Mustard and Potato Salad and a sausage with a difference recipe. Members left with lots of new ideas, and having tasted all the food with full stomachs! Grateful thanks to the Ladies in Pigs. We had an excellent visit to Flintham museum in July and a very tasty Summer dinner at the Royal Oak in early August. Our speaker, Alison Clark, gave us an amusing and informative talk about being a duty solicitor visiting police cells at any time of day or night and of being a magistrate. Alison presented us with real life speeding offence cases and we had to decide on the punishment to be given. Some members wanted to give sentences higher than those allowed by the sentencing guidelines whilst others wanted to be able to hear more about mitigating circumstances before giving out the punishment - this is not allowed! The moral of the evening is- Don't drive over the speed limit! April saw the County Annual Meeting held at the Concert Hall in Nottingham. Attending a meeting such as this reminds us that we belong to a huge National organisation and it was fitting that being the Centenary Year that the National Chair (Janice Langley) was one of the speakers. 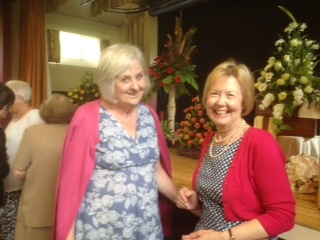 The County Chair (Jane Jefferson) presented Margaret Foss with flowers for serving over 35 years on the Cookery and Craft County Committee and for being a Denman Tutor for 20 years. 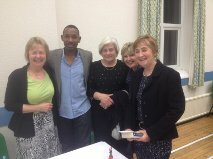 The speaker at our April meeting was Mrs Gill Wright. She spoke about the need to encourage bumblebees into our gardens. She asked us to consider planting a range of plants to help the bumblebee population. These included rosemary, heathers, honeysuckle, thyme, lavender and cornflowers . There are 25 different species of bumblebees in this country but only 1 species of honey bee. Members celebrated Mrs Connie Stobbs' special birthday. There is now a photo of us at the Houses of Parliament on the Gallery page. East Bridgford W. I. was founded in 1917 and we are lucky to have Record Books from the very beginning. These are going to be available to view at the Coffee Morning on Saturday 25th April in the Hut, 10 a.m. to Midday. Home-made cakes and coffee will be available and money raised is to be donated to the Care Group. Our March Meeting was the Annual meeting so we had reports from all the W.I. 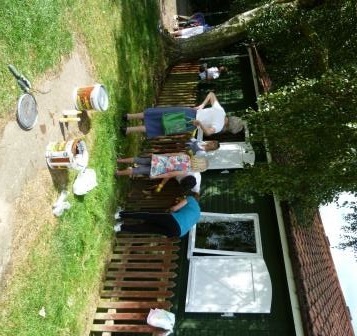 activities such as darts, whist and craft. We are an active W.I. within the county, taking part in a wide variety of opportunities provided to keep members fit, healthy and alert. There are lots of Centenary celebrations taking place and the National Annual meeting to be held in the Albert Hall in London is to be screened live in a Nottingham Cinema. Another Centenary event is a Garden Party at Buckingham Palace in June and Mrs Marjory Soar was chosen, by ballot, to attend. Marjory was also re elected as President and we are delighted to have a larger working committee. Mrs Margaret Foss organised a light hearted quiz testing members knowledge of Healthy Eating after all the formal business. What a fascinating informative speaker Mrs Denise Taylor, from Hearing Dogs for Deaf people, proved to be for our February meeting. It was interesting to learn the charity started over 30 years ago after Dr Bruce Fogle ( Ben Fogle's father) heard about a similar scheme in America. Hearing Dogs is a self funded charity raising money buy selling merchandise (much of which was bought during the evening, largely I expect that a fascinating informative speaker Mrs Denise Taylor, from Hearing Dogs for Deaf people, proved to be for our February meeting. It was interesting to learn the charity started over 30 years ago after Dr Bruce Fogle (Ben Fogle's father) heard about a similar scheme in America. Hearing Dogs is a self funded charity raising money buy selling merchandise (much of which was bought during the evening, largely I expect for grateful grand children), donations and by re-cycling used postage stamps (Denise trims approximately 20,000 stamps per year for the charity before they can be sold). Deaf or hearing impaired are the largest group of disabled people in this country with 1 in 6 people being affected. Having a `Hearing Dog` gives people independence, companionship as well as the security of being made aware of noises we take for granted such as door bells, smoke alarms and alarm clocks. We were also entertained by John and his `Hearing Dog`, Poppy, who was able to tell us how much it means to him having a dog. Of course for many Poppy was the star of the show, and I for one would happily have taken her home! !or grateful grand children), donations and by re-cycling used postage stamps (Denise trims approximately 20,000 stamps per year for the charity before they can be sold). We were also entertained by John and his `Hearing Dog`, Poppy, who was able to tell us how much it means to him having a dog. Of course for many Poppy was the star of the show, and I for one would happily have taken her home!! Our January meeting was an insight into the role of women pilots in World War II. John Whitfield ( known to many in the village through his WEA classes) talked enthusiastically about these daring women working in a male orientated environment. The women worked for the Air Transport Auxiliary (A.T.A.) which in turned worked for the R.A.F. but was not part of the R.A.F. They would deliver new planes and take damaged planes for repair. As they navigated by land sight, poor weather was their greatest danger. This was the cause of Amy Johnson's tragic death in the Thames when she had to bail out of a plane in thick fog. The A.T.A. did not train pilots so all the women had learnt to fly before the war. When you consider that lessons, pre 1939, cost £18 per hour at a time when shop workers earned £3 per week. This tells us much about the social standing of these "Ladies". As usual we had a question and answer session followed by refreshments and time for a catch up with friends, old and new. In December we had a festive evening as we were taken back to 'Merrie England' and a taste of the Twelve Days of Christmas in the 17th Century, by our speaker Janice Moulds a volunteer at the National Trust property Woolsthorpe Manor. We learnt that we would be likely to be eating swan and mutton, although turkey was being enjoyed by royalty. Minced pies would be filled with mutton and beef as well as raisins and sultanas, and illustrations of Father Christmas would show him dressed in green. Did you know that they actually did make pies with live birds in? The lids were pre-cooked and then placed over the birds so when the lid was taken off the pie the songbirds would flutter out, extinguishing the candles used for lighting! The servants would then parade into the dining hall with banquet food! We enjoyed a superb 'faith' supper of festive 'goodies' washed down with a glass or 2 of wonderful mulled wine specially created by Irmgard. `Deal or no deal` came to mind as our speaker, Lynda Kinnard, had members deciding which of her many boxes were to be opened. Each box contained a different craft, many of which related to small items to make Christmas special. The everlasting crackers were greatly admired. Other items included funky fairies, wired ribbon favours and holly corsages. Lynda gave inspiring demonstrations, which encouraged many of us to buy her patterns or kits and have a go at home. Our first meeting after our Summer break drew 25 members and 4 visitors to come and find out about the ancient martial art of Tai Chi. Joy Parsons gave a potted history of Tai Chi and some background into her Tai Chi career and training. We then spent a very interesting 15 minutes trying our hands at some of the simple exercises before Joy demonstrated a part of the 'long form' that has taken her 3 years to learn! Tea and cakes were served to refresh us, followed by a chat among friends. Des entertained us splendidly with the story of his early life and his career in television and theatre, suffice it to say there was never a dull moment during this very convivial evening. 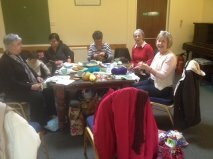 Gill, Harry(our youngest crafter) Lampii,Christine, Carole and Marjory. Newark town walk - Civil war trail. 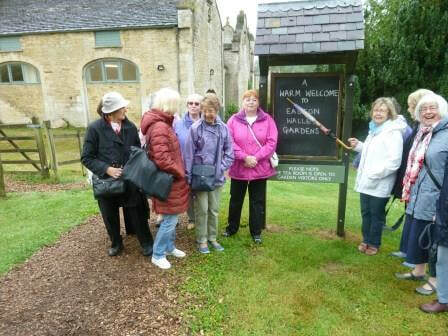 Four East Bridgford members,Jane Pat Marjory and Brenda, joined approximately twenty- six other WI members from around the county for this fascinating walk around Newark town to learn more about it's role in the English civil war of 1642. The day was a bright and sunny one and the walking was easy. It was remarkable to look above the shops at the ancient buildings and learn about the historic events that took place in them. 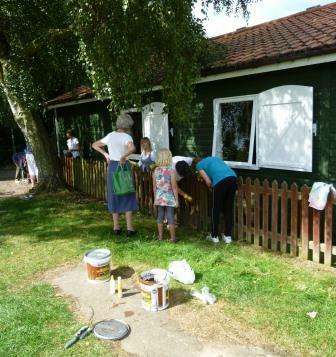 After a couple of hours we returned to Trent Bridge House and enjoyed a delicious home cooked lunch. 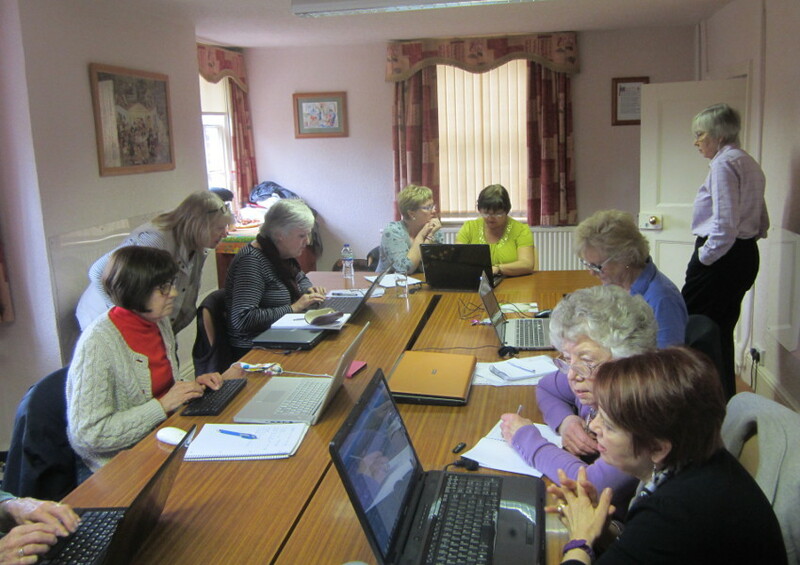 One of our members Brenda, a self-confessed technophobe, took her courage in her hands and attended a course at Trent Bridge House to learn how to build a website for East Bridgford WI. A warm welcome awaited her and the coffee & cakes kept her blood sugar boosted and her brain cells working. The day proved to be a challenging but successful one and we now have this very young but fully formed website, which will grow like Topsy over time. The annual fee for joining the WI is just £41 in 2018. If you join mid-year you pay pro-rota on a quarterly basis.